Terry and I have been very careful about discretionary spending since we have moved south, for obvious reasons. But given the sale of my internet domain at a price greater than I would have expected, I decided to allow myself an indulgence. My old iPad 2 was getting slow and applications were crashing. 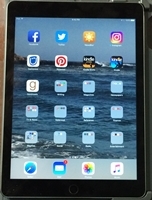 Since I use it every evening, seven days a week, I decided I was due for an upgrade. 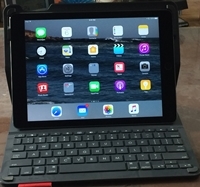 I bought a new iPad Air 2 and a Logitech case + keyboard to go with it. I’m delighted. The iPad is thin and light, and the keyboard case provides a sturdy environment for the iPad. The Logitech keyboard/case is designed to work in landscape mode, while all this time I have used my iPad in portrait mode. But it’s fine. It is stable. It works well. And I don’t have the possibility of my iPad doing a back flip out of the keyboard as could happen with my old iPad and keyboard. Meanwhile, the old iPad 2 and keyboard sold for a good price on eBay. That will partially reimburse me for this new purchase. The nice thing is that they will be a Christmas present for someone’s youngster. All good stuff. It’s a real delight.